Ages 5 through 9 and older remedial learners. 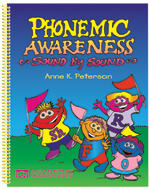 Here is a collection of fun, easy-to use activities for phonemic awareness training. The activities are organized by sound, as well as by spelling patterns and skill areas. The activities address phonemic awareness along with other important skills such as inferential reasoning, use of contextual information, etc. Listening for Vowels and Diphthongs. The English vowels and diphthongs are presented in this section. Vowels are organized by spelling patterns so that the activities can be integrated into classroom spelling lessons. Listening for Consonants. The consonants are presented individually. The lessons can be used in conjunction with classroom lessons that focus on specific sounds. Listening for Blends. Consonant clusters in which constituent letters remain their phonemic integrity are included. Supplemental Picture Worksheets. Illustrated worksheets are included that can be used in a variety of ways to build phonemic awareness.